We love our dedicated readers and our most loyal social media followers. We also love receiving emails from companies all over the country asking us to review their products, sample clothing or experience a new local business. A few weeks ago, I received an email from Stacey at Table Top Media Group. She extended an invitation to come and dine at J. Alexander’s, a new restaurant located near the King of Prussia Mall; this is their first northeast location. Side note to all my national readers: King of Prussia Mall is 20 miles west of Center City Philadelphia. Of course, we said yes! First of all, the location is excellent. The King of Prussia Mall is second to none! The shopping there is fantastic! From Nordstrom, Saks Fifth Avenue and Neiman Marcus to Boss, Burberry, and Coach, the King of Prussia Mall has everything. However, I’m going to put shopping aside for a hot minute. Walking into J. Alexander’s was nothing short of spectacular. As soon as you walk in, you see an elegant bar to your left. Perfect for happy hours and weekend catch up with friends. The hostess staff was very attentive and escorted us to our table. The ambiance of J. Alexander’s is very intimate and gives off a very contemporary upscale décor that is very inviting. They believe in a private dining experience where you can communicate with the person you are with (without having to shout), and their setup makes you feel as if no one else is in the restaurant. Every server helps one another no matter which section you are in. Always rest assured that your drinks will always be filled and your plates will be cleared on schedule. Shortly after we were seated, Brandi, our delightful server for the evening, reviewed the specials, catch of the day, wine and cocktail list, and her favorites on the menu, which were many. My husband and I ordered a cocktail (‘21’ Manhattan) and the artichokes as an appetizer. While we decided on our main dish, we were met with many difficult choices. The menu at J. Alexander’s is very robust! Everything on their menu sounds terrific. Halibut, crab cakes, ribs, ahi tuna, oh my! The decision was difficult, but I landed on the halibut, and my husband went for the crab cakes. After we put our order in, we had an opportunity to talk more about J. Alexander’s with Brandi. Along with being a server, she is the lead trainer, so there was no better person to have during our dining experience. She gave us a bit of history about J. Alexander’s, the excellent way they treat their staff and a little bit about that specific location. 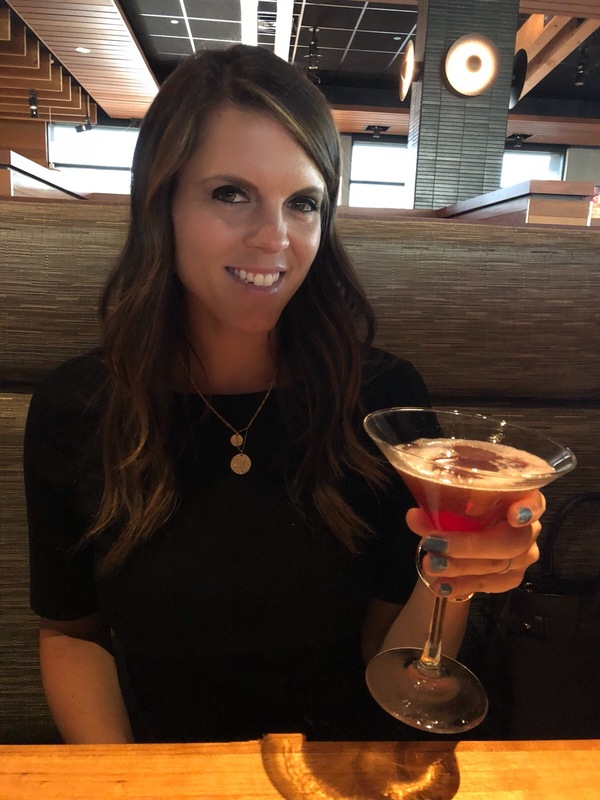 Brandi talked a lot about how J. Alexander’s is not a chain restaurant – they have 44 restaurants in 15 states – but more of an “unchained” dining experience. This unchained philosophy helps them keep the integrity of the food and service that makes it such a beautiful place to eat. After a round of Alex’s Salads, our entrées came. Wow! My halibut came with a side of orzo pasta rice (divine) and bok choy. I wasn’t in love with the bok choy as it was a little too salty for my taste, so Brandi gave me another side, which was the mac and cheese. Yes, I am lactose intolerance, but it was so worth it. My husband had the crab cakes, and they were very, very delicious. His crab cakes came with a side of fries and this coleslaw that was out of this word! Halfway through the meal, Emily, the manager at the King of Prussia location stopped by our table to make sure our experience was going well. She made sure that our meal was cooked to our liking and made sure Brandi was taking care of us, which she was. I loved how she did that with every table, not just ours. After our entrée plates were cleared, Brandi insisted we had a bite of dessert. Because we love our loyal readers so much, we just had to dive in – for research purposes. Spoiler alert: J. Alexander’s makes a mean chocolate cake. Their “Very Best Chocolate Cake” triple chocolate bundt cake with a side of California’s own Humboldt Vanilla ice cream – wow! Just a few bites and I was in pure happiness! Overall our experience at J. Alexander’s was fantastic. The food, the staff, and the intimacy of the King of Prussia Mall location were second to none. I highly recommend that after long shopping trips with your closes friends or significant others, that you venture to Jay Alexander’s on your way back to Philadelphia. You’ll be glad that you did! Have you dinned at J. Alexander’s restaurant before? We would love to hear about it; please share your experience below!